Ever had that conversation about what you’d do if you won the lottery? Talk about all the things you would buy if cost didn’t matter and the world was your oyster? Of course you have! It’s a blast to think about the ways you could spend a few hundred million dollars, whether it’s buying mansions or taking your entire town out to dinner. While statistics tell us you’ll probably never win the lottery, there’s nothing wrong with the occasional daydream about what would happen if you did. Whenever I have this discussion, logic and realism always get worked into the dialogue. I start thinking about the annuity versus the lump sum, then the overall tax situation and how to stay grounded after the world gets flipped upside down. This conversation has always been lighthearted and a little fanciful, though I recently realized there are a few financial lessons to be learned from lottery winners. 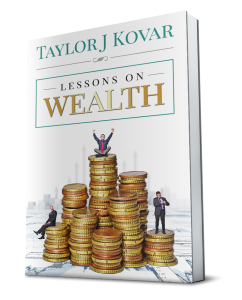 Once you look past the millions and the .000000005 percent odds, you can actually get some insight about wealth management. As savvy financial moves go, playing the lottery is not one of them. That said, let’s use the Powerball winner as a premise to discuss some money matters everyone should care about. If you want examples of why it’s risky to play fast and loose with your money, look no further than some recent lottery winners. The sudden increase in funds consistently leads to poor financial decisions. I’ve seen this countless times with young athletes who hit big paydays, and studies show that nearly half of all jackpot winners go broke within five years. Most people are astounded when they hear about someone winning several hundred million dollars and then promptly losing it all. Unfortunately, it’s easier to do than you might expect. First off, people always forget to account for taxes. While winners still take home a huge amount of money, they often start spending the funds in their heads before realizing how much they’ll actually get. This seems like an easy mistake to avoid, but it happens with absurd regularity. The other issue is gifting. I believe generosity is one of the pillars of leading a good life, but I also recognize that you have to be smart about it. Few people have to worry about giving more than the $5 million gift-tax exemption. However, imagine you just won $200 million; you’re surrounded by elated friends and family, people you love and want to provide for. Can’t you see yourself promising all of those people a measly million dollars? How fun would it be to stuff seven-figure checks in a bunch of stockings? Giving gifts is an incredible thing, but it gets a little complicated when big money is involved. So how does this apply to your life? Unexpected taxes and penalties on huge gifts might not factor into your reality. However, there’s definitely a lesson you can take away from people who have won big and then lost it all. Now matter how much you earn, you have to be extra careful with your spending after your income gets a boost. The biggest financial missteps are typically made right after someone comes into money, whether it’s from an inheritance or a promotion at work. I don’t quote the Notorious B.I.G. very often, but I know that “mo money, mo problems” is a very real issue for a lot of people. It’s easier to make foolish purchases when you feel like you have more money to spend. If you buy one too many cans of tomato sauce when you’re shopping on a strict budget, it’s not that big a deal. If you buy one too many Maseratis after making partner at the firm, you’ve got a real financial headache coming your way. A lot of people have no idea how standard annuities work, yet they completely understand the annual payout option available to lottery winners. A Powerball annuity and an annuity investment have distinct similarities, though the policy you get from an insurance agent lacks pretty much all of the benefits awarded to a person who buys a winning ticket. Personally, I’m not the biggest fan of annuities. There’s a lot of inflation risk, terrible illiquidity, and the tax rates often get holders in trouble. I definitely see the appeal, in that retirees want money to keep coming in year after year. I especially see the value if you’re a Powerball winner and you’re trying to avoid spending all your money at once. However, before you decide these policies are perfect for you, it’s worth investigating to understand why annuities are so popular and the areas in which they come up a little bit short. Standard annuities, sold through insurance companies, are intended to provide stability and long-term benefits. You can choose between fixed, variable, immediate, and equity indexed annuities, each with different pros and cons (more cons than pros, in my humble opinion). Like many retirement accounts, these policies are essentially untouchable until you’re 59½, which is an issue jackpot winners definitely don’t have to deal with. Again, the philosophy behind annuities is sound; you shouldn’t view your retirement savings as a block of money to spend when you’re old, but rather as the salary you’re going to live off once you stop working. However, many insurers use this philosophy as a hook when selling policies that come with massive commissions and subpar tax rates. If you aren’t careful about selecting the right product, you could end up with something that works in theory but doesn’t do so well in practice. Lottery winners are usually making the smart choice when they pick the annuity over the lump sum. In your case, there are likely a lot of better ways to prepare for retirement. For obvious reasons, winning millions of dollars changes a person’s life. As we’ve discussed, striking it rich can also lead to extreme financial hardship down the road. The Powerball winners who make the most of their winnings are the ones who avoid crazy purchases and instead find the best investments for their money. Even if you’re not a millionaire right now, there’s no reason why you can’t take the same approach. When you’re fantasizing about what you could do with a billion dollars, you don’t have to dismiss those thoughts as foolish notions. If your dream is to start a small business, consider how you might be able to invest in local companies now. Would you buy fine art if you had a few million dollars? Start thinking about original paintings and sculptures as investments and see what you can do within your price range. People with extra spending money have the luxury of testing out investments. When they do so in excess, it usually ends up causing financial distress in the long run. If you don’t have a lot of money to play with, that doesn’t mean you can’t experiment with investment strategies - you just have to be more careful when you do. In the end, being cautious with your money is what will keep you from making bad investments that never bring you any returns. I know too many people who have been discouraged by investing because they felt like they needed more money to make it worthwhile. If I had let that stop me back when I was a young man toiling with massive debt, I never would have built the life I’m currently enjoying. When you invest a dollar wisely, it can turn into two dollars. Two dollars might be a long way off from a million, but you’re 100 percent closer than when you just had a buck. The next time you see a lottery winner smiling and holding that ridiculously large check, don’t settle for being jealous. Think of how you would put that money to work and then start transcribing those dreams into ideas you can act on. Working as wealth manager, I come in contact with a lot of people who have recently taken a big financial step. Whether it’s signing to a record label or picking the right six numbers, there’s always an urge to adopt a new lifestyle after the money starts rolling in. From my experience, changing how you live almost always leads to personal and fiscal problems. Aside from the obvious regrets like spending too much on caviar and champagne, people let money damage their relationships and objectives. When you believe that a certain number of dollars will allow you to afford certain commodities/services/luxuries, you allow money to dictate what’s important to you. There are too many joys in life that are much more meaningful than money; giving the dollar top priority is a surefire way to miss out on a lot of life’s greatest gifts. It’s also hard to sustain a life that’s driven by earnings. If you let income define you and suddenly your income drops, it’s going to be very hard to come to terms with it. Most people don’t have any trouble diving into a lavish lifestyle, but it can be really hard to go back to living frugally if the well suddenly runs dry. Had any of those now-broke lottery winners chosen to keep their jobs, stay in a modest house, keep eating at the same restaurants and skip the 40-foot yacht, they could have avoided a lot of pain and suffering. If they’d bought real estate instead of plane rides and stocks instead of cars, they’d probably be even richer now than when they first hit the jackpot. Best of all, they would have maintained their values and stayed true to themselves and the people they love. An influx of cash certainly has the power to change your life for the better. However, if you give it too much power, you might make your situation a whole lot worse. There are plenty of dos and don’ts you can learn from a Powerball winner, and I find the issues above become particularly magnified after an unexpected financial windfall. If you only take one thing away from this article, I hope it’s an understanding that there’s no such thing as easy money. You have to work to earn it, and you have to work equally hard to keep it. Fortunately, there’s nothing stopping you from doing that work. Putting in the effort and being proactive is the best way to see the results you want. In conclusion, please don’t ask lottery winners for financial advice; around 44 percent of them will lead you wildly astray. However, you should feel free to learn from their successes and failures, and then start looking after your own financial future. If you follow the smartest decisions made by a millionaire, there’s no reason why you can’t put yourself on a path toward wealth and success.